With simplecall, you can talk for hours with your friends and families in Algeria for cheap. Algeria is a fascinating nation due to its amazing landscape and demography. This makes Algeria a place worth visiting or living. It is the fifteenth biggest oil exporter on the planet, exporting about $4 billion worth of the commodity to the USA. simplecall allows you to make really cheap international calls to Algeria. The service is exceptional because, despite being cheap, the quality is not. 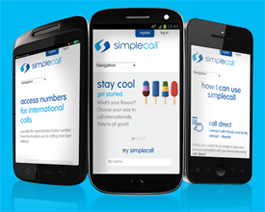 And, unlike calling cards, you don’t have to purchase simplecall from a market or store. Instead, all you have to do is register online and then keep enjoying our great service with PINless dialling for all your international calls. Talk for hours with your loved ones in Algeria with the cheap international calling service from simplecall. simplecall brings you a worry-free and affordable international calling experience. Making calls to Algeria from the USA starts from 12.03¢ /min for both landlines and mobiles. Remember it is a PINless calling service and you will never deal with any hidden fees or mystery charges. To start making cheap calls to Algeria today, www.simplecall.com and register for free. You will be connected to your family and loved ones in no time!